As the December 31, 2013 expiration of EPAct Section 179D steadily approaches, it is becoming increasingly important for parking garage owners and operators to plan for energy-efficient lighting upgrades in order to take advantage of EPAct tax savings. Fortunately, the recipe for successfully retrofitting parking garage lighting to achieve tax deductions is widely available, especially because parking garages have become one of the most popular tax incentive categories for EPAct. The wide range of improved and highly energy-efficient lighting technologies that substantially reduce parking garage electricity consumption has made parking garages into one of the fastest growing EPAct tax deduction categories. Also helpful is the fact that the IRS has provided relief in the form of a corrective filing on a current tax return for any missed deductions, meaning that parking garage owners or operators who have already installed sufficiently energy-efficient lighting but have not taken a tax deduction can now do so. 2. HVAC (Heating, Ventilation and Air Conditioning). Each component can qualify for up to 60 cents per square foot in EPAct tax deductions. The building envelope is anything on the perimeter of the building that touches the outside world including roof, walls, windows, doors, the foundation and related insulation layers. IRS Notice 2008-40 Sec. 6 specifically references parking garages as an eligible building category for Section 179D tax deductions. Due to the unique aspects of parking garages, these deductions are usually limited to $0.60/sq.ft. for lighting1. In order to qualify for the tax deduction, the lighting system must exceed the efficiency set by ASHRAE. Table 1 highlights these specific targets. 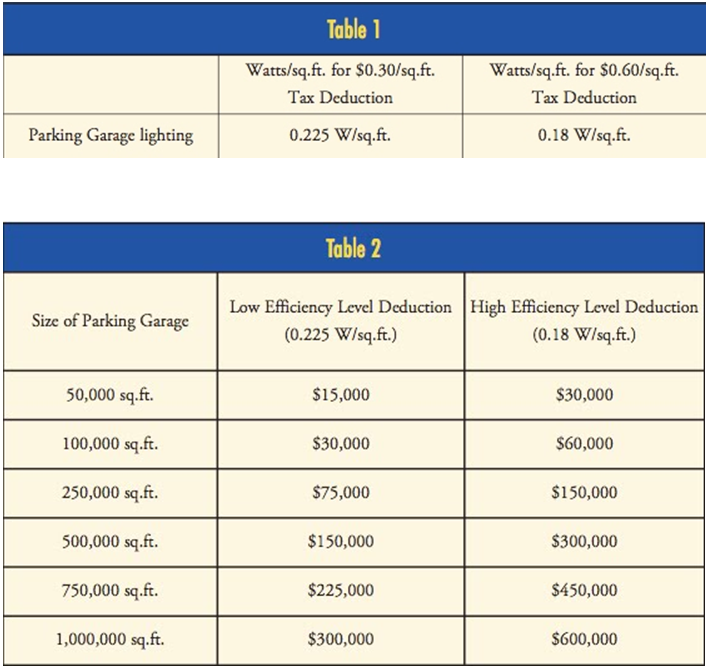 Table 2 shows how the tax deduction varies with different size parking garages. Parking garages in particular are one of the most popular EPAct categories. Parking garages make excellent EPAct candidates because lighting electrical use is the primary energy cost and large buildings drive large EPAct deductions. EPAct tax benefits for lighting have entered the mainstream because virtually all of the large lighting manufacturers and distributors are emphasizing the importance of the tax incentive with their sales proposals. The potential for an immediate EPAct tax deduction of 60 cents per square foot is a meaningful economic incentive for lighting projects, many of which range from 60 cents to $2.00 per square foot in installed costs. The lighting market is enjoying sustained strength. Rising electricity costs, more rigorous state and local building energy codes, and improved lighting products are resulting in compelling economic paybacks, many times less than two years. As a result, it is easier for facility executives to win funding for energy-efficient lighting investments. Lighting specifiers are increasingly comfortable with the EPAct lighting requirements and know that they can meet them for most property categories. This confidence enables them to include EPAct tax benefits right in the initial lighting proposal. In fact, a lighting proposal without an EPAct tax benefit calculation is now unusual and hence somewhat suspect. Each of the three major parking garage lighting technology alternatives have strengths and weakness that need to be evaluated. Items to consider include investment price point, utility rebates, building environment, lighting performance, operating costs, lamp life, warranties, dimming characteristics and maintenance costs2. To date, fluorescent lighting, utilizing T-8 and T-5 lamps, has been the most common product selection for energy efficient lighting. With fluorescent lighting conversions, density of fixture layout is critical to minimizing energy use and maximizing EPAct tax incentives. Without attention to design we see some projects that miss a tax deduction or only achieve a partial tax deduction. Fluorescent installations generally have the lowest installed price-point of the three major lighting technologies. LED or Light Emitting Diode lighting is moving quickly into the parking garage marketplace. There are many competing vendors and product offerings and garage owners need to research and compare product offerings. Due to the low wattage level most LED parking garage projects qualify for the maximum EPAct tax deduction but some projects are right on the edge of eligibility so it is important to have an EPAct knowledgeable reviewer the calculation. In an interesting market development, induction lighting, although available in the U.S. for over ten years, is enjoying high growth in the parking garage market albeit from a relatively small installed base. Now that parking garage owners have two distinct product alternatives in fluorescent and LED lighting they seem to be more open to compare and contrast a third lighting alternative. Induction tends to have a price point in between fluorescent and LED and has its own particular attributes warranting evaluation. Induction lighting is actually fluorescent lighting without electrodes and is sometimes called electrodeless discharge lighting . Prescriptive rebates are a fixed amount per product such as $30 per fluorescent fixture. Prescriptive rebates are common with high volume, mature product categories because utilities are thoroughly familiar with the products energy performance results. Accordingly, most utilities offer fluorescent rebates based on a prescribed amount available from a prescribed table or listing. Custom rebates are tailored or customized to the products' expected performance and are normally calculated based on the electricity expected to be saved. Hence, custom rebates for electricity-based products are sometimes called kW(kilowatt) rebates. Many utilities are not yet familiar or supportive of LED and induction lighting products so the exclusive rebate opportunity may be a custom rebate. Since LED and induction lighting is low wattage lighting, a probing into a custom rebate may result in a dialogue resulting in a much higher overall rebate than the typical prescriptive process. Many parking garages still have mainstream prior generation energy inefficient metal halide and T-12 lighting. As of January 1, 2009 probe start metal halides are illegal to manufacturer in their most common wattage categories. T-12 magnetic ballasts are also illegal to manufacture as of July 1, 2010. As replacement costs for these banned items increases, parking garage owners will naturally retrofit to one of the 3 efficient technologies. There are a wide variety of commercial garages where either the garage owner or a tenant/garage management firm can obtain the EPAct tax deduction benefit depending on who paid for the energy-efficient lighting. Typical commercial garage owners include commercial city garages, commercial airport garages, apartment buildings, office buildings, department stores, hotels, and casinos. With government-owned garages, the design team is entitled to the EPAct tax deduction. For tax purposes a designer can be an architect, engineer, lighting designer, design and build contractor or an ESCO (Energy Services Company ). It is important to note that by statute the tax beneficiary is the designer and not the government entity. The government owner reaps the larger economic benefit which is the permanent perpetual energy cost reduction. The parking garage lighting designer or design team earns a onetime tax incentive for designing an energy efficient facility. An ever increasing number of larger cities that have numerous parking garages are enacting mandatory commercial building energy usage benchmarking rules with public disclosure by prescribed time lines. Those cities include Austin, Los Angeles, New York, Seattle and Washington D.C. One of the major goals of these laws is to provide tenant and consumer transparency. The consensus advice is that parking garage owners may be best advised to upgrade to energy lighting before being obligated to report an inferior building. Though it may seem to be a long time from now, parking garage owners and operators should be particularly mindful of the approaching December 31, 2013 deadline. Retrofit projects tend to have long lead points to bring a project to completion, meaning that the time it takes to have initial, exploratory discussions to executing the project by installing more energy-efficient lighting can take months, and therefore a two-year window before expiration is not as long as it seems. With the recent announcement of IRS Revenue Procedure 2011-14 outlining Form 3115, the IRS is now providing a 3115 change of tax accounting alternative, which means that taxpayers can go back to any EPAct year, starting January 1, 2006, and include the tax deduction results in a current tax return, thereby eliminating the need for amended tax returns. Parking garage owners are particularly well-suited to take substantial tax deductions over the next two years because of the confluence of the factors discussed above. To put it succinctly, the sooner parking garage owners and operators act, the greater the likelihood that they will be able to achieve major energy cost reductions and large EPAct tax incentives. 2 - Charles Goulding. Jacob Goldman, and D. Malcolm Thomas, "Multiple Lighting Technologies Drive Large EPAct Tax Deductions for Parking garages," International Parking Institute (August 2010), at 23.